The idea and importance of companionship is often different to each person. Some people value this connection immensely and consider it one of the most vital goals in life. For others this is something which possess a somewhat different level of importance and meaning. 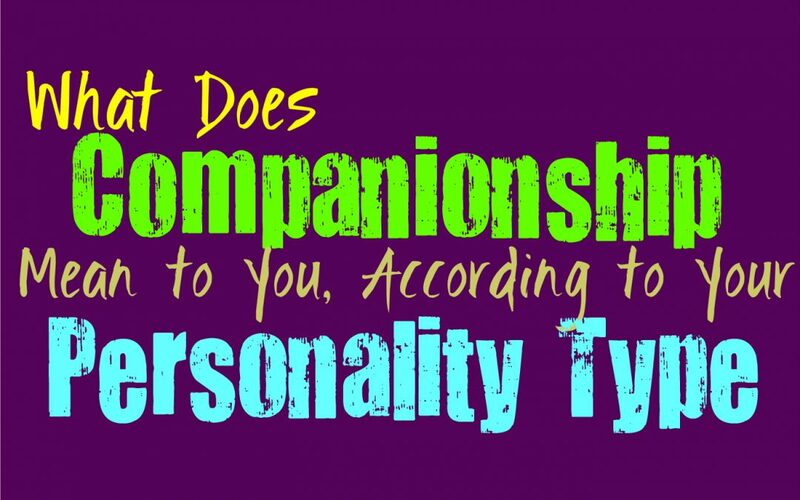 Here is what companionship means to you, based on your personality type. For the INFJ a sense of companionship is actually deeply important, and something they are often searching for. They might not find it easy to really find the exact type of connection they want, since they want much more than a simple shallow bond. INFJs want to find someone who they can truly feel connected to and spend time in their presence. For the INFJ this is what companionship means, being able to understand one another and feel a sense of comfort in the presence of this special person in their lives. A sense of companionship and connection is truly important for ENFJs, and is often something they are searching for in life. To them this means having someone they feel close to and comforted by. ENFJ see a sense of companionship as having a person they can trust and rely on, someone who understands and appreciates their presence. For ENFJs having this type of bond is truly important, without it they often feel lonely and even a bit unhappy. ENFJs search for these deep connections and a sense of belonging by being close to someone special. For the INFP companionship means having someone they trust and rely one, someone they feel connected to. They believe it is important to share themselves with another person, and are often searching for someone who they can trust enough to do this. INFPs don’t just want shallow connections, they want something deeper and much more meaningful. For the INFP companionship isn’t worthwhile if it is found with just anyone, instead they want to feel a closeness with people they feel understood and appreciated by. ENFPs definitely believe that companionship and connection is important, and they certainly value it in their personal lives. ENFPs see companionship as having someone to spend their time with, even if that just means relaxing on the couch. Having someone they can be themselves around is truly important and definitely gives them this sense of companionship and connection. For ENFPs this type of comfort is truly something which brings them joy and a sense of meaning in their lives. INTJs might be seen as independent and factual people, but they do value companionship. To the INTJ a sense of companionship means having someone they can turn to when they need help or support. Someone who understands them and also knows how to give them space when need be. For them this companionship means having someone who is always on their side and ready to show them a sense of support and sincerity whenever they need this. For the ENTJ companionship is definitely important in life, and sometimes they are often searching for but willing to be patient with as well. ENTJs see companionship as having someone to stand by your side through thick and thin. They believe it is someone they can trust and rely on, someone who is always loyal to them no matter what. For the ENTJ companionship is certainly something to be valued and is certainly something they are searching for in their lives, they just don’t want to accept any type of connection and want something more meaningful. To the INTP companionship simply means having someone they can be themselves with and feel a sense of comfort by their presence. This is something they often desire in life, but they also need this from someone who is willing to give them space. For INTP true companionship only comes from a connection with someone they can trust and sincerely rely on. They need to be around someone who they trust and who does not constantly judge them, and in this case they will feel a sense of companionship and they will value this. ENTPs often see companionship as having someone they can lean on and tell their problems to without judgement. They believe that this should go both ways and be something they share with this individual. For ENTPs companionship means being loyal to one another and bringing each other a sense of comfort and connection. They do often value this idea, and want to find people they can really trust and feel close to without it being draining or feeling like work instead of joy. For the ISTJ a sense of companionship is often all they are looking for in their relationships. To them this simply means having someone they can rely on and trust, someone who will remain loyal no matter how hard things become. For the ISTJ companionship comes from having someone they care for, who will be by their side without causing stress or pressure. They strongly value companionship and want to find it in people they can trust and truly bond with. ESTJs value a sense of companionship and are often searching for this in their lives. To the ESTJ companionship means having someone you can rely on and turn to when things get tough. It means having a person who will remain loyal to you, no matter what happens. Having this sense of connection and someone they can trust and just relax with, is deeply valuable and important to the ESTJ. They want to find this connection with someone, and a sense of companionship is deeply comforting to them. ISFJs deeply value companionship, whether this be with family, friends or romantic connections. For them it simply means feeling close to someone and having this person by their side when things are tough. To the ISFJ companionship means two people supporting one another and bringing comfort with their presence. They value this type of bond and feel deeply rewarded when they experience companionship with others. For ESFJs companionship and connection is something to be deeply valued, and is often one of their main priorities in life. To them companionship means having someone they can rely on, someone who they feel close to even when they are apart. ESFJs desire companionship deeply, and often feel unhappy when they don’t feel it as a presence in their lives. For ESFJs this is a deeply important things, having someone they feel close to and comforted by. They want someone they can rely on, but who also relies on them when they need comfort. For ISTPs companionship isn’t just about spending time with someone, it is about feeling safe to be themselves around them. True companionship for the ISTP means being able to feel that connection without constant mindless chatter or neediness. They want to be around someone who lets them be themselves and doesn’t attempt to change them in any way. ISTPs want companionship, but they want it with space and room to breathe. For ESTPs companionship is often something rather simple, and just means having someone who is there for them. Having someone they can spend time with and actually feel rewarded from that time together. ESTPs can become bored with people or feel drained by their presence easily, so having someone who they do not grow weary of, is certainly something to value. To them this ability to be around someone for prolonged times and still feel connected, this is true companionship. For the ISFP companionship means someone they can be themselves without completely without any sense of judgement or fear. Without this sense of being able to feel safe with someone, the ISFP doesn’t really feel a strong sense of companionship. It also means having someone they can sit with and simply be silent, while still feeling close to that person. The connection means being there for one another, without having to constantly communicate it. For ESFPs companionship means having someone they can connect with and feel close to. For them it just means spending time with someone and feeling a sense of comfort in this time spent together. ESFPs want to be around people they can have fun with and laugh with even when things are hard. They want to feel a sense of connection and joy when they are around someone, and to them this is the true meaning of companionship.